Breast Cancer Action and a coalition of consumer and health organizations have launched a campaign called Milking Cancer, where you can demand from Eli Lilly that they withdraw their dangerous bovine growth hormone from the market. For more on bovine growth hormone, see the 18-minute film, Your Milk on Drugs. Years ago, an owner of a glass company was arrested for throwing bricks through store windows in his town. What a way to increase business! Has Eli Lilly figured out the drug equivalent of breaking, then fixing our windows? In August 2008, the huge drug company agreed to buy Monsanto’s bovine growth hormone (rbST or rbGH), which is injected into cows in the US to increase milk supply. It was an odd choice at the time. A reporter asked Lilly’s representative why on earth his veterinary division Elanco just paid $300 million for a drug that other companies wouldn’t touch with a ten foot pole. The drug’s days were obviously numbered. The former head of the American Medical Association has urged hospitals to stop using dairy products from rbGH-injected cows, the American Nurses Association came out against it, even Wal-Mart has joined the ranks of numerous retailers and dairies loudly proclaiming their cows are rbGH-free. In fact, Monsanto’s stock rose by almost 5% when the sale was announced, and Eli Lilly’s dropped by nearly 1%. The main reason for the unpopularity of this hormone, which is banned in most other industrialized countries, is the danger of insulin-like growth factor 1 (IGF-1). Dozens of studies confirm that IGF-1, which accelerates cell division, substantially increases the risk of breast, prostate, colon, lung, and other cancers. Normal milk contains IGF-1, milk drinkers have higher levels of IGF-1, and the milk from cows injected with Eli Lilly’s drug has much greater amounts of IGF-1. You can connect the dots. Would it be too crass to point out the obvious conflict-of-the-public’s-interest that Eli Lilly also markets cancer drugs? In fact their drug Evista, which might help reduce the risk of breast cancer, may lower IGF-1 (according to one small study). So on the one hand, Eli Lilly pushes a milk drug that might increase cancer, and on the other, it comes to the rescue with drugs to treat or “prevent” cancer. Call it the perfect cancer profit cycle. Cows treated with rbGH have much higher incidence of mastitis, a painful infection of the udder. This results in more pus in the milk (yuck). But don’t worry. It’s Eli Lilly to the rescue again. They are one of the companies happy to sell antibiotics to dairy farmers to treat the infection—which can’t help but increase antibiotic resistance in humans (double yuck). But would Eli Lilly consciously risk our health just to increase their profit? What kind of company are they and can we trust them with our food? If recent events are any indication, you better look for rbGH-free labels. One doctor even warned: “unless we come clean on this, it could get much more serious than we might anticipate.” It did indeed get serious. They paid out hundreds of millions in settlements to people who claimed they developed diabetes or other disorders. Eli Lilly was also the maker of the infamous Diethylstilbestrol (DES), a synthetic estrogen. Starting in 1938, it was prescribed to pregnant women to prevent miscarriages and other problems. Although in 1953, research showed that it didn’t actually prevent miscarriages, it continued to be used until 1971, when the FDA alerted the public that the daughters exposed to DES in the womb were at risk of a rare vaginal cancer. An estimated 5-10 million pregnant women received DES. The civil courts held Lilly liable because they should have foreseen (based on prior information) that DES might cause cancer and that Lilly should have done the proper testing before marketing it. He said, for example, that Eli Lilly had mysteriously lost organ samples that may have shown problems in injected cows. And their researchers came up with creative ways to hide reproductive changes in the animals. Specifically, injections appeared to suppress cows’ regular menstrual cycle or reduce the visual symptoms. The company was required to report the number of cows “in heat,” but was told by the FDA that they could not use bulls to identify them. If bulls were needed, then the label on their drug would have to inform farmers that they would need a bull to help identify which cows were in heat. And most farms didn’t have bulls. According to Burroughs, FDA investigators figured out that Lilly researchers secretly pumped up a heifer—a young female cow—with male hormones, so that the transgendered animal would act like a male and be attracted to the cows in heat. Lilly followed the letter of the law by not using a bull, but well, you can decide if you want to trust these guys. Eventually, Lilly and two other companies withdrew their products, leaving Monsanto’s brand of rbGH as the only one that got approved and marketed. But Lilly worked a deal where they represented Monsanto’s drug outside the US. They sell it in 20 countries, including South Africa, Brazil, Colombia, Honduras, Kenya and Mexico. And now, they offer it in the US as well. In May 2006, an article in the Journal of Reproductive Medicine concluded that rbGH use, and the subsequent increase in IGF-1 in the US diet, is probably the reason why we have much higher levels of fraternal twins compared to the UK, where rbGH is banned. Mothers with twin births are more likely to suffer from hypertension, gestational diabetes, hemorrhage, and miscarriage. Twin babies are more likely to be born prematurely and suffer from birth defects, mental retardation, cerebral palsy, vision and hearing disorders, and serious organ problems. How many drugs do you suppose Eli Lilly sells to treat these disorders? 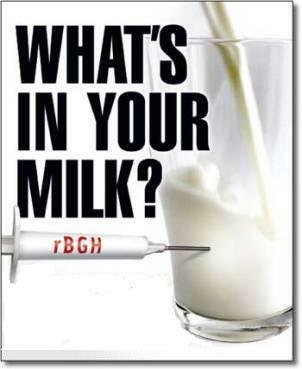 Tell Eli Lilly to take rbGH off the market and out of your milk. To learn how to choose healthier non-GMO brands and milk without rbGH, visit www.NonGMOShoppingGuide.com.